I signed up today for Spotify. This is a music service that like all the best innovations can be explained in a few words. You download the client (Mac or Windows), which has a Mac-like user interface for searching and playing songs. You type in a search, double-click a song in the result list, and it plays. When it finishes, it plays the next one in the list. So far it has worked flawlessly. Performance is the key. Searches are fast, and songs seem to start playing instantly – impressive. 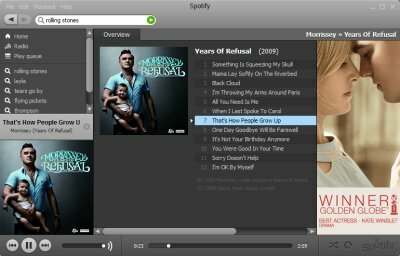 Now and again an advertisement plays in between songs – it’s not too intrusive, but for a ad-free experience you can sign up to a premium subscription, currently £9.99 per month or £99.00 per year. The selection of music is not comprehensive; last month a number of songs were withdrawn “…so that we implement all the proper restrictions that are required by our label deals.” Nevertheless, the selection is wide and includes many mainstream artists. The latest Lily Allen is there; so is the latest Morissey as illustrated above. A search for Beethoven revealed 9,302 tracks; Mozart 14,148. Most people will find plenty of music they like. In 1999, Shawn Fanning created Napster, a peer-to-peer music sharing service that allowed users to share MP3 files. It was wildly popular and illegal, and introduced the download era to a mass market. Download is about amassing a collection of music files on local storage and playing them through a computer or over a network. Ripping a CD is really just another way of downloading it. The company that has profited most from the download era is Apple, with its market-dominating iPod/iTunes combination. But what is the point of downloading a song, if you can play it just as easily without downloading it? What is the point of “buying” a song, if you can already play it whenever you want? What is the point of ripping a CD in order to make a copy that is identical to copies made thousands of times already, when you can easily access a shared copy over the Internet? There is none; and all-you-can-eat streaming is the natural successor to the download era. That does not mean we are there yet. Format changes in recorded music are not instant; there is a long transitional period. You can still buy LPs today; CDs remain a major source of revenue for the music industry; Spotify will not kill iTunes overnight. Audiophiles will not be satisfied with Spotify’s lossy-compressed music format for serious listening. Further, Spotify has some limitations. Playing on mobile devices is one problem that will not easily be solved, bearing in mind that while broadband internet at home is now widely available, fast mobile connections remain expensive and unreliable. History also suggests that Spotify will not necessarily be the company that makes this a business success. The music companies might panic and remove their works from Spotify. Apple might buy the company, and/or transition iTunes to a similar subscription-based streaming service. You can be sure it will not stand by and watch as its music business become irrelevant. Nevertheless, even a day with Spotify is enough to make the idea of only being able to play what you have already downloaded seem quaint and unnecessary. Previous PostHyper-V disk I/O: performance of dynamic vs fixed virtual hard disksNext PostSqueezebox and Napster – the perfect combination? Good article Tim, but I’m not sure I see the lack of reliable mobile connections as such a problem. I would expect a mobile version of Spotify to pre-cache content on a mobile device in much the same way as it does on the desktop. Provided you’re not repeatedly changing tracks, walking in and out of hotspots shouldn’t stop the music. I currently use the Last.fm app for my Android G1 – it’s fantastic provided I have a good 3G signal. The minute I walk into a dropped out zone, I lose the tune since Last.fm can’t prefetch much due to license restrictions. I’m hoping the mobile Spotify apps won’t have this problem. p.s.long-time reader of your blog, but first-time commenter! I downloaded the Mac client and agree with Tim’s statements, the music choice was alot better than I expected, picking some slightly obscure tracks 20+ years old didnt cause a problem. Works a treat but again as Tim says it probably wont be too hard for itunes to encompass similar functionality which may threaten spotify. How about being able to play the cd in the car, almost any car, without an mp3 connection? Or the sound quality loss of many downloaded tracks? There is still a place for the old cd yet.